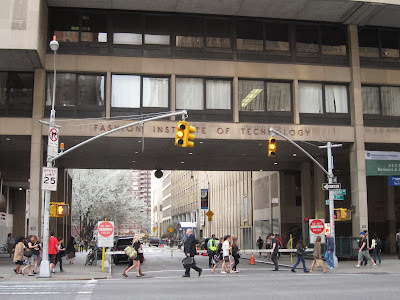 I've lived just a few blocks from the Fashion Institute of Technology (FIT) for more than twenty years, but have rarely been inside, aside from the bookstore and the museum. It's a very busy place; even the escalators move very fast! Our large classroom is full of industrial machines and dress forms, with a large blackboard in the front of the class. There are roughly twenty students. Right off the bat, Professor B states that generally there's a 30% attrition rate; i.e., only 2/3 of us would be remaining by the end of the semester (which ends in May). Shades of "America's Next Top Model"? The other students seem friendly. I'd say we're 2/3 men, 1/3 women: black, white, Asian, Latino, a German, maybe an Italian and a Russian; we didn't have much time to mingle. I suspect I'm the oldest, but there are a few other men with gray in their hair so I don't feel ancient. An artsy-looking group but not overly so; only one guy in a suit. I wore my black gingham shirt, mustard pants, toggle coat, and Clark's desert boots. I suspect I'm the only one who sewed his whole outfit but who knows. A quick aside: I haven't been in a classroom like this in decades; I went to college with a manual typewriter (anybody remember Eaton's Corrasable typing paper?) and we took notes by hand (with ballpoint pens) in notebooks. Today, it seems, most students come to class with at least a smartphone that has a camera and movie capabilities; many have an iPad or laptop. If you need a record of what's being displayed (on a blackboard, for example), you just take a photo of it. If you want to remember what's being said, you video it. I guess this won't surprise many of my readers, but it did me! Thread (not the big serger cones, not home-sewing spools, but rather those chunky spools they sell at a place like Sil Thread; I have a ton of those). Jar or something similar to keep our presser feet in. He also recommended we mark our feet to identify them as ours with perhaps a spot of nail polish. We spent some of the class tracing plastic pattern pieces to make a men's dickey: i.e, a half-length shirt with no sleeves, onto white paper. I guess we'll use these down the line; I'm not sure when. We also learned to thread the Juki industrials and spent about 30 minutes trying to control their speed. These machines go super-fast and, as someone who generally likes to sew slow for total control, I found them a challenge. We can have as much access to the machines between classes as we need, either in the Sewing Lab or in any vacant classroom (provided we sign the room out in advance). Naturally, the bulk of the learning is going to happen between classes, and the more time you put into it, the more you'll get out of it. For next class, we have to take three sheets of narrowly lined paper and, with just a needle in the machine and no thread, sew perfect lines of stitching down every line on all three pages. And hand it in! We discussed different qualities of shirting, and were shown samples at different price points, from plain gingham to a luxury Etro print. 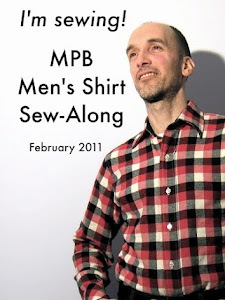 For next time, we're to bring in 5 swatches (just swatches) of 100% cotton shirting costing at most $10/yd. (No info on where to purchase; I guess it's expected that students figure this out on their own). Also 4 18" pieces of shirting (cut parallel to the grain) to practice with. Professor B showed us how to do a burn test and how to tell if there's poly in the fabric (the hard bead in the ash). He explained that the length grain is the most stable, the crossgrain is the second most stable, and the bias is the least stable - and we were to refer to them in exactly that way. Professor B explained how shirts are priced. I learned that CMT (cut, make, trim) is the manufacturing cost of a garment, but does not include the cost of fabric. So if your fabric is $40/yd and takes two yards, and the CMT is $10, your cost without profit is $90. Keystone is your profit and it's generally double that. So if your cost without profit is $90, adding your keystone brings it up to $180. If you have a "name" you might charge $200 (that's the wholesale price to the store). So Bloomingdales might sell the shirt for $400 -- double. Again, this is standard practice. It seems what happens more often is that they'll charge $500, knowing they'll sell a certain % at that price, then reduce it to $400 and sell so many more, and so forth. So they (Bloomingdales) will keep making money on that shirt until it sells for $200. Then, what often happens, is that, based on all the statistics they have tracked from your shirt, they'll manufacture their own private label shirt and sell it for $400 -- with none of the research and design costs you incurred as a manufacturer. This is why department store private label profit margins are huge. It sounds like everybody in the industry knows what everything costs. So you can't sell your $10/yd. shirt for $800. Nobody's going to carry it. Of course, if you're a Tom Ford or a Giorgio Armani, the rules might be somewhat different. And that's it, everybody. I found the pace of the class fast and the expectations very high. And that's exciting -- and new -- for me. A very different world from the one I've known for the last four-plus years. That sounds really cool! I've heard about people just recording or taking pictures instead of notes in class, but I've never seen it happen here (and I was still in school last year!). Maybe because it was art school and we didn't have too many theory classes (a few hours a week at most) so writing everything down wasn't such a huge job? I'm curious to hear more about how your classes go! This is fascinating to me! Thanks, Peter. Good luck, Peter. Fascinating post. Thanks for sharing the pricing structure with us. Looking forward to hearing more about this class. So interesting! Thanks for a virtual visit into the classroom. Have fun with your studies! Maybe the half-shirt is going to be for first attempt at collar bands and collars? Interesting point about the phones and video, I noticed you didn't list any books required. Another reason to start seriously considering getting a smart phone. Thank you for sharing the details of your course, I look forward to hearing more. So very interesting. When I first saw this post I thought you were going to be teaching the class. I was surprised to learn you were taking it. I loved my time at FIT; I hope you enjoy the hell out of it! This is so exciting! Thank you for letting us be on the "inside". Would love go there one day! Wow! It sounds exciting. I cannot wait until your next class report. I have heard that too. My relative has an industrial machine and she said the same. They scare me to death. I have an industrial Juki and a few vintage Pfaff home zigzags. I use the Juki when I need to do straight stitch finished samples or low volume production. When I do first samples, the 50's era Pfaff is my workhorse, since on one machine I can do zippers, zigzag stitching, change feet and needles easily, not so easily done on the single purpose industrial Juki. So don't throw those vintage treasures out quite yet, Peter! Excellent run down of the class! Generally, here in Australia, if you want to video or audio a class you need to ask the lecturer permission. I found most said yes and some classes provided an audio recording of a lecture but not of a tutorial. Very interesting. I think I could stand to do that sew on the lines with no thread thing. it would be great practice. I can't wait to hear how many drop out after the straight line sewing assignment alone, but I'm sure you won't be one of them. An inexpensive nail polish fine-line pen might work to mark your machine feet with your initials or small design. I've taken that class and didn't realize that so many students drop it. The exercise with the loose leaf paper is very useful and fairly easy. I think that everyone would say that learning to sew the collar and collar band on the shirt is the most difficult part of the course. It doesn't matter, one way or another, but I don't know anyone who marks his or her presser feet; people do write their names on rulers, etc. this is FASCINATING. i hope you keep giving us your experience! Thank you for recapping the class. I found it very interesting. As always, great information - your presentation is wonderful. I will be living completely vicariously through you for this class! Fascinating stuff! I love the homework about sewing down the lines, but then again, I was always the goody-two-shoes with perfect homework. 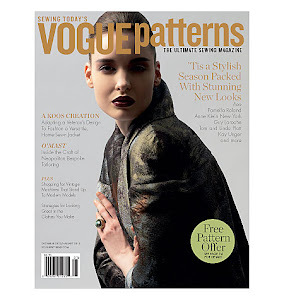 I did get Patternmaking for Fashion for Christmas though, and I'm trying so hard to get started on my slopers. Work gets in the way of everything. Maybe this week, since I finally sent all those sewing machines out for repair. I found someone one town over who specializes in older machines. I, too, found all of this fascinating. Thanks for the glimpse into this world. I applaud your willingness to branch out in unfamiliar territory and look forward to more posts charting your learning. Fascinating! Sounds very demanding which is also a bit thrilling! I took an industrial sewing class at MCTC in Minneapolis and the class content seems identical. We started sewing paper, then moved to samples and finised the class making a tailored shirt to industry specs. Once you get used to the industiral machine you'll love it. I bought a Juki before I even finished the class. Do you have any idea how many people are jealous of you? Oh, how exciting! Have fun! Thanks for sharing your experience! It feels like I was in your pocket listening Professor B taking. If people take pictures for notes could you take a pic or two to show us on the blog? I love learning about pricing and the like. This is going to be a very useful class I'm sure. BTW, totally surprised by taking pics of notes but it strikes me to be a very good use of technology. Learn now and review later. When you take notes you have to think too much. This is going to be a great addition to your blog. Worth the time and expense.....really fun reading you observations. I find it really interesting students are required to purchase bobbins, accessories, et al....what do you do with the items later? It seems to me it would make sense (if the admin gods are worried about broken machine parts) that they would roll it into the cost of the course. Who knows??? Have a wonderful time with the class! I still have mine; I don't use industrial machines at home so they're just sitting in a box. You need to have those little bits of your very own for classes because anything left on the machine might go walkabout. I am certainly jealous! I am happy to hear every detail of your class; it's so exciting. The talk about attrition? I heard the same exact lecture the first day of art school from every studio teacher. I don't think that you'll be in that 1/3. I think industrial machines are scary. A neighbor left one on my doorstep and so I decided on a whim to check out an industrial sewing class - they wanted us to master concentric circles on the first day. Needless to say, I was the 30%. You, however, are much more skilled and determined than I and I can't wait to hear of all your successes!! Regarding purchase of bobbins, etc. There is a STRANGE thing going on out there. Renters bash equipment senseless, while those "with skin in the game", don't. Renters can break equipment in ways manufacturers NEVER see from owners. Oh, this is so fun. Thanks for the post. Tell us more about your classmates. The pricing info was interesting. This post was just absolutely fascinating, I thoroughly enjoyed reading it, thank you Peter looking forward to your next class! Thanks for this wonderful account! 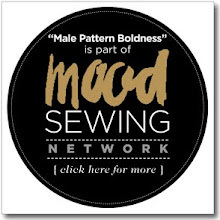 I can't wait to hear more, and I'm so excited that you are in fact benefiting from taking Menswear Sewing. What a fascinating experience this is going to be. What strikes me is the simplicity of tools you're using, excepting the industrial machine (which would terrify me!). Can't wait to read more about the class! I'm excited just reading your description of the class! It actually sounds kind of exhilarating - learning new things in a fast-paced environment. Right now my life goes so slowly that I don't think I could adapt. I can't wait to hear more. What a great overview! You should get a lot out of the class. Is the tape you need the transparent tape? If the instructor didn't specify otherwise, you will find the 1/2 inch tape much easier to work with than the 3/4 inch tape. Have to wonder who's buying all these $400 shirts. That's about what I get to live on for a month. Isn't it fascinating to learn about the pricing? When I took just one class at FIT, there was a whole lot of talk about the business of fashion, and after a while, I just wished we could get back to the pretty or the technical or the different colors, fabrics, embellishments. That was my "home sewing" slip showing. So interesting to read - really fascinating. I find it odd that they expect students to buy the various feet for their machines. I assume anything not nailed down will quickly go missing and it's just not worth the risk of having classroom machines that can't be used. PS - My machine's lamp was missing its bulb! Wow! While reading I was simply amazed by all the information given and expected from students starting from day one. I can't wait to read more as you continue with the course. I do have a question. When watching Runway I often take note of the professionally trained contestants making comments and observations about those who are self taught. Now that you have had a peek into their world do you think they are justified in some of the less than kind comments? Especially when it comes to the industrial machines? I can't wait to see if you do end up preferring the industrial machine. And thank you for the quick glimpse into shirt prices-- fascinating. Thanks for letting us audit the good bits of the class. I really enjoyed reading about how shirts are priced. Totally fascinating! Can't wait to read more of your posts as you progress. And none of that finding yourself in the attrition group, ok?! Good grief how things change. I might have typed my papers on a computer, but I took notes by hand. I can't imagine what the professor would have done if we had recorded the entiere class! You got the evil eye back in the early 2000's if you so much as whipped out your laptop to take notes. My how things have changed in the nine (9! when did that happen?) years since I graduated! That was a very interesting read Peter. Hope you carry on sharing your weekly experiences with us! I was just a FIDM in LA yesterday looking around so it will be interesting to see your impressions of the classes you take. Fascinating read - I'm really looking forward to hearing about this course. I'm not too good at sewing in perfectly straight lines so my "homework" is the lined paper exercise. At the university where I worked lectures are filmed and every student is emailed a hyperlink to the presentation a few minutes after it is delivered. No need to even turn up (and many students don't). How exciting! Great post. The first time with an industrial is crazy. We has juki in our class and even though they were all the same model they all had individual quirks. We did straight lines to do too but also ever decreasing circles, they took practice. This was so fascinating! Thanks for sharing - I feel like I got the insider scoop. If it makes you feel better, I graduated from college in 2010 and STILL took all my notes by hand with pen and paper. That is very interesting about the pricing structure. i thought when I started sewing that I would be able to make a garment for 1/10 of the price. But usually it ends up being more like 1/2 if I use good quality materials. I feel much better now knowing that the markup for the professionals is only about 4 times the costs. Best wishes for a productive semester! The FIT bookstore is a fantastic resource for drafting and seeing supplies. That's very interesting. You're brave--I would be intimidated, even if I were better than the beginner that I am. I'm looking forward to hearing more about your class each week. It is funny about students taking photos of things instead of notes; I always found there was something about the actual process of writing something down that made me remember it. It wasn't just seeing it written down; I had to write it down myself and somehow that put it in my head. Precisely. BTW, this class is elementary-level. There's no assumption made that you already know how to sew. Everyone take notes as well. The photos are supplemental. The classes can sometimes be stressful because you're trying to take notes, snap photos and the class may have 20 people crowding around a table. (The teacher will show you again if you didn't understand.) 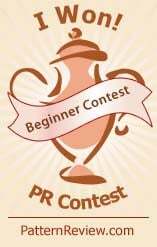 It gets a little easier as you take more classes, but every teacher teaches his or her own method and a book, while generally helpful, won't have the necessary details to do the assignment as the teacher instructed. I found in my class all the young 'uns would only ever take photos. They thought I was extraordinarily strange for writing notes and drawing diagrams. For me, writing/drawing the information is the best way for me to learn and remember, while photos would be handy for revision. I found that I simply had to work faster in order to fit in all my note taking along with the actual work, which wasn't necessarily a bad thing. And now I have a great set of resources (folders according to topic) that make sense to me. I miss my classes terribly - I attended for three years part time. I loved the industrial sewing machines - I long for my own but have neither the room or money for - and I loved learning. I'm so pleased you're trying this, Peter, and I'm very excited for you that it appears interesting and fast paced, already. Like everyone else, I look forward to your weekly summaries! Sounds demanding and a lot of fun! I think generally you can assume that the price of a product will at least double at each step of the supply chain which always disturbs me when I come across regular-priced clothing like a tshirt for $5. You just know that the person who made it can't have been paid much at all. When I stopped teaching at Uni a few years ago students were beginning to bring in laptops and some were asking to leave a recording device on the lectern. I would supply printouts of the Powerpoint slides. I can see the use of recording but assuming you can take photos of things instead of notes is going to let them down because a good lecturer will only have the main points up there, not the whole lecture. But I guess it's the way of the future (sigh). Great post! Love all the details. Please post pictures if you can. Love your blog!!! 1) Videotaping demonstrations is against the rules at FIT. Some teachers don't mind, but Prof. Blackman in the past has specifically forbidden it, citing an FIT student who put his videos on the web and was sued by FIT for damages of about $80,000. 2) You are allowed to take pictures of the demonstrations and the instructions he puts on the board. 3) Fashion Design Books, the store across from FIT on 27th Street is cheaper than the FIT Bookstore. Did your professor tell you how to cost the CMT? How do you estimate that if you're making one of a kind and don't have factory personnel behind you doing everything at top speed? Good question! I guess we'll learn that eventually. Great post! I haven't taken an FIT class since 1996 or so, and I still have my bobbins! How ridiculous is that? I did really enjoy the experience, though. I did Design Room Techiniques, Draping 1 and 2, Tailoring, Fashion Art, Fashion Business, Fashion History... and I can't remember what else. Fun, though! Fascinating! I can't wait for the next installment. Thanks for letting us follow you to school Peter! You are one lucky duck. Make the most of every moment there. Caveat. My career was in corporate American where products and services were not sold to the end-used customer in retail stores, collectively known as Retail. First, it is interesting to me to hear "Keystone" is now used as a noun. I had always prior heard it used as a verb (NO idea where the term came from). Second, "margin" or "markup" or "profit" is ALWAYS expressed as a percentage of SELLING price. THAT means "Keystone" is a 50% margin (or markup or profit) NOT a 100%. This came from the days when a merchant could count his cash in hand at the end of the day and know how much profit he had. $320 cash in hand meant $160 profit. While "Keystone" (or "Keystoning" as I might on occasion have heard the term) was double (wholesale) cost, it still was a 50% margin. Which was about right for "soft" goods. "Hard" goods margins were/are about 40%. In addition, a good General Rule Of Thumb regarding wages is two rules. 1.) Total cost of wages per employee is wages paid to the employee plus fringe benefits, Fringe bennies go about 40% these days. In other words, a $10/hour employee costs a business about $14/hour. 2.) A company has to make at least $3 (gross) profit for each $1 in (total) wages paid to have a chance at turning a corporate profit. $4 is better. Above $4 leaves a company seriously open to competition. This is just the necessary profit on wages. Profit on marterials (and research) is yet another thing. THAT means a CMT of $10 must return $30 or more profit, for a company to have a chance of profit. Profit on materials is extra. Labor/wages costs can go down only by finding cheaper laborers (moving overseas used to be that method, though not so much anymore) OR reducing labor TIME (by using better, more efficient machines). Clothing companies come and go with the wind, even faster than restaurants. Thank you for your great contribution here. According to the Merriam-Webster dictionary the definition of "keystone" is: something on which associated things depend for support. And then the synonyms for this are: basis, bedrock, bottom, cornerstone, footing, foundation, ground, groundwork, base, root, underpinning, warp, warp and woof. Interesting that the final definitions fit with the foundation of the fashion world. This is so INTERESTING! I am so glad you signed up for the class and that you're sharing it with us. Thank you for taking the time to write so much interesting detail - fascinating! Looking forward to reading more! Shannon D.
Fascinating! I am eagerly awaiting the next instalment. 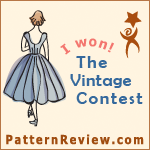 I attended the American Sewing Guild's conference in LA a couple of years ago. I took a tour of FIT, and I instantly wanted to pack my bags and enroll!!!!! You're soooo lucky!!!! Enjoy! Thanks so much for sharing your journey with us. I look forward to following the adventure. In another life of mine (in the early 70's) I was a teenager working is a sewing factory that made men's shirts (Arrow, division of Cluett-Peobody). We called it "The Shirt Shop." It was a tough education in working with people and sewing on very fast industrial machines. I learned many jobs in my few years there. 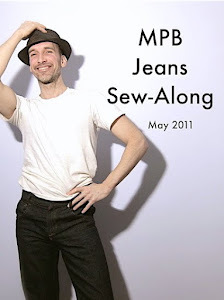 I still love sewing and have an old Pfaff 230 semi-industrial that sews perfect and fast. I often think I need to be tied to the machine to keep from flying away, it's so fast. My domestic machines are great, but slow. Peter- You are so generous for providing the amount of detail about your class (and so beautifully written). I just started reading this series of posts on your FIT class. Although home sewing has not been mentioned yet, at some point, the professor may say to a student "have you ever sewn before?" and then you will know! Can't wait to keep reading your posts and the comments, as they are informative!! Thank you. Professional Sewing Classes -- YEA or NAY? FIRSTS for 2014 -- Book, Pattern, HAT! First Fabric-from-the-Trash Haul of 2014! DAY 2: Newsboy Cap TRUE CONFESSIONS! DAY 3: The Completed Cap + Newsboy Cap FAQs! National Pie Day + MPB's FOURTH Birthday! Leopard Coat Update or "Meet Me in Miyake"
Buy an industrial sewing machine? Are you NUTS? Peter Models the Issey Miyake Leopard Print Coat!